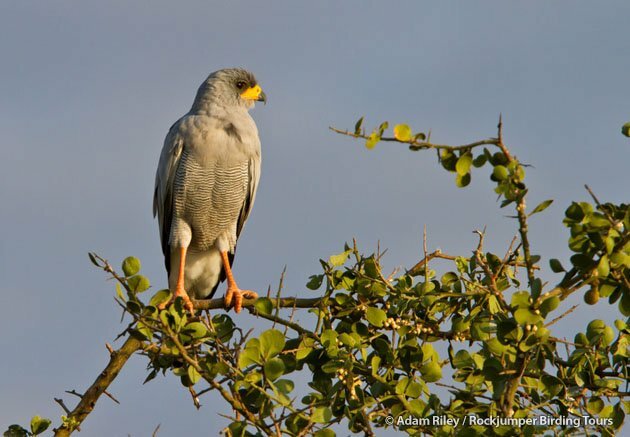 Ethiopia, a landlocked country situated in the Horn of Africa, has firmly established itself as one of Africa’s top birding destinations. 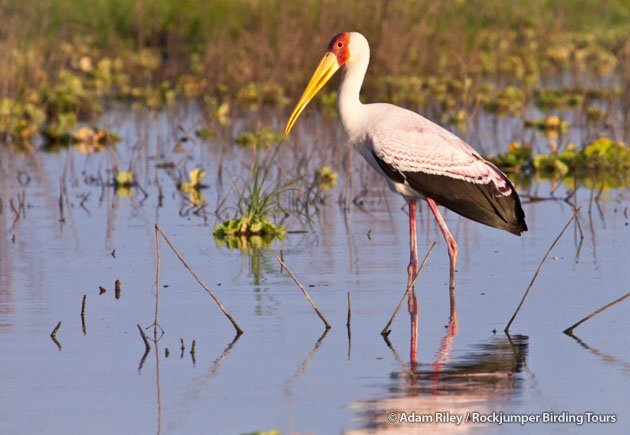 Its great diversity of habitats hosts an incredible bird count of over 900 species, including Africa’s 2nd highest list of endemics and near-endemics (after South Africa). These 15 endemics and nearly 40 near-endemics (many of which were endemics until Eritrea gained independence from Ethiopia in 1991) are for the most part quite easily observed on the standard Ethiopian birding circuit. 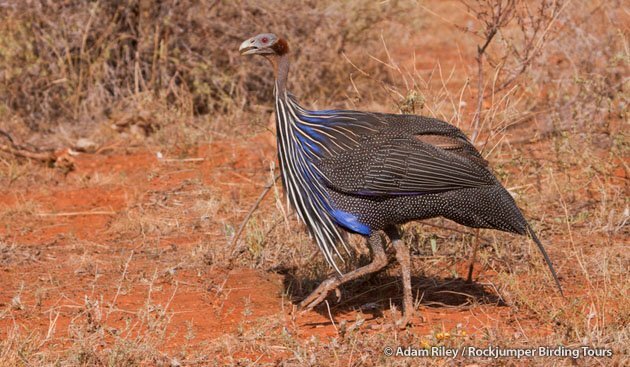 However very few birders ever venture to areas off this well-beaten track, so with this in mind, I decided to explore a fascinating but ornithologically little known corner of Ethiopia in January 2012, to see what surprises awaited me. The Lower Omo Valley is situated within Africa’s famous and geologically-speaking rapidly expanding Great Rift Valley (which will eventually split the continent into two landmasses). Here, in south-west Ethiopia’s awkwardly named “Southern Nations, Nationalities, and People’s Region”, bordering Kenya and Sudan, the great Omo River dominates this dry savanna valley, resulting in some of Africa’s most well developed and best preserved arid-zone riverine forests. The Omo River rises from the Shewan highlands to the north (much of Ethiopia consists of high-lying mountains and fertile plateaus, despite the impression created by some international media bodies that Ethiopia is predominately desert!). It flows 470 miles, mostly southwards, before entering Lake Turkana (previously Lake Rudolf) near the Kenyan border. Lake Turkana, the world’s largest permanent desert lake and also the planet’s largest alkaline lake, has no water outflow, so in effect it’s a dead-end for the Omo River. 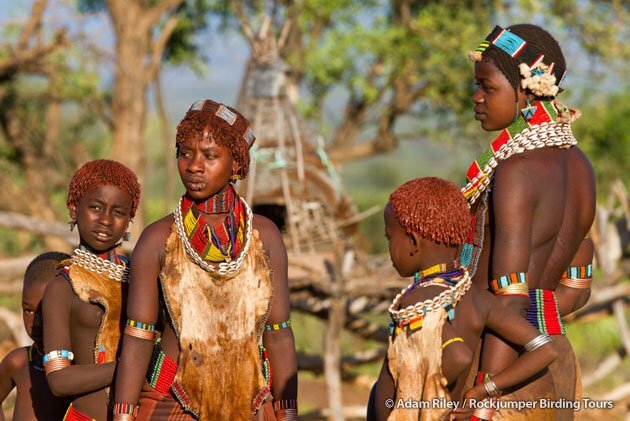 The importance of the Lower Omo Valley has been recognized by UNESCO, who has declared it a cultural World Heritage. 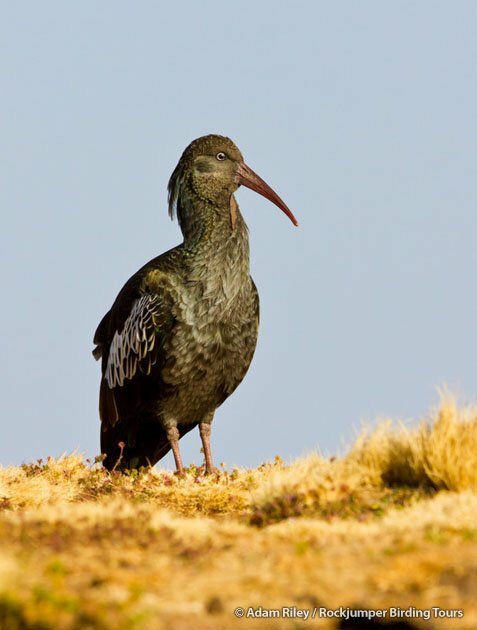 It also contains two massive national parks and several Important Bird Areas. This vast, scenic valley is now most famous for its staggering cultural diversity. Over a dozen distinctive ethnic groups exist here, many of whom live lives little touched by the modern world. This is largely due to the remoteness and prior near inaccessibility of the area, forming a natural barrier to modernization and the detribalization of the Omo Valley. Recent publicity about these remarkable tribes has resulted in tourists wanting to experience this wild land and its attractions for themselves. Several lodges have subsequently opened and a surfaced road is being built to allow easier access to the valley. The Lower Omo Valley is also famous for its significant anthropological discoveries, including hominid remains of several distinctive species, going back as far as four million years, as well as the earliest known skeletons of our own species (nearly 200,000 years old). The Omo Valley has clearly been a cultural crossroads of great significance for eons, and continues to be so. Nearly 2,500 square miles of the wildest sections of the Omo Valley are protected in the almost contiguous Omo National Park on the river’s west bank (Ethiopia’s largest park) and Mago National Park on the east bank. These vast and rugged lands of savanna, hills, gorges and rivers still protect some of Ethiopia’s largest extant herds of typical African savanna game, including African Elephant, African Buffalo, Giraffe, Lion, Leopard, African Wild Dog and numerous species of grazers. My adventure to the Omo Valley started with a flight from Ethiopia’s bustling capital, Addis Ababa, to Arba Minch, the largest city in southern Ethiopia. It lies adjacent to Nechisar National Park, where the lone wing of the mysterious Nechisar Nightjar was collected in 1990. We were hoping to do a night-drive in the park to search for this enigma, but sadly the majority of the park has been closed due to impassable roads and allegedly hostile nomadic tribes who have invaded the park and are currently in a stand-off with authorities. We were able to take a thoroughly enjoyable boat ride on Lake Chamo, whose shores teem with birds, including such typical African species as African Fish Eagle, Goliath Heron the world’s largest, Yellow-billed Stork and the incomparable Hamerkop, a species in its own family. A visit to what is known as the “crocodile market” had us viewing a haul-out of dozens of Nile Crocodiles, including some of the largest specimens I have encountered anywhere on the continent. Pods of Hippopotamus snorted at us, however the keen birders were more enthralled at finding the highly localized Northern Masked Weaver. Heading south on a good surfaced road, we made slow progress through the herds of cattle, donkeys and goats that thronged the highway, until we finally reached the land of the Konso. This area is also a UNESCO World Heritage site famed for its quaint stone-walled villages and terraced fields. We spent a fascinating few hours on a guided tour of one of these villages. 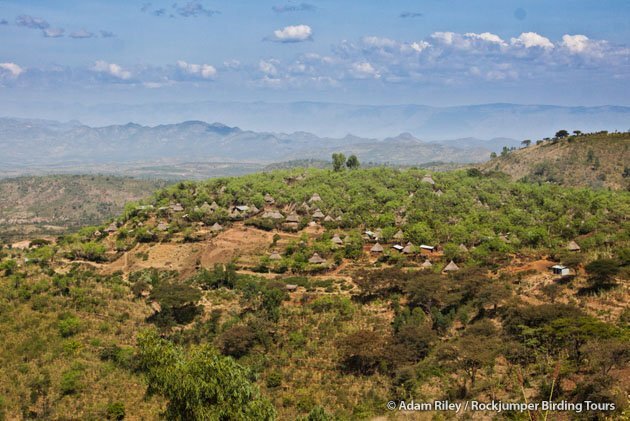 Communal living and co-operation, with the retention of traditional values, has afforded the Konso people a relatively prosperous existence in an arid landscape. Striking westwards towards the South Sudanese border, we pressed on to the town of Key Afar, noted for its bustling market frequented by four local tribes. We were left with little doubt that we had finally reached the fabled Lower Omo Valley as we strolled through the market, admiring the stunning traditional dresses, adornments, hairstyles and scarification of these proud peoples. We then turned south again, deeper into the Omo Valley, to the village of Turmi, where we found respite at the welcoming and comfortable Buska Lodge. A cold beverage and meal of traditional unleavened Ethiopian bread called injera rounded off a fascinating travel day which couldn’t be matched anywhere in the world! 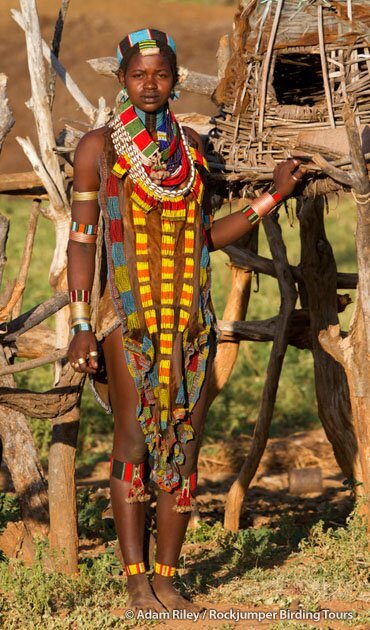 The Turmi area is home to the Hamar tribe who numbering nearly 50,000 are one of the largest ethnic groups living in the Lower Omo Valley (with an approximate population of 200,000 tribal people). Early morning is of course birding prime time and a pre-breakfast stroll around our lodge produced sightings of the lovely Orange-bellied Parrot, which we tracked down to a nesting hole right next to the restaurant. 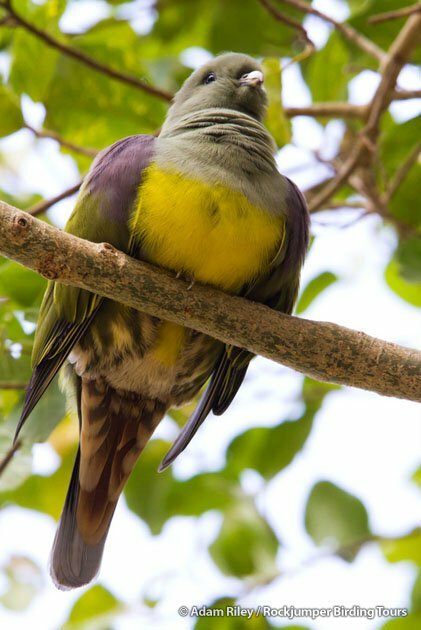 Splashes of color were added by cryptic Bruce’s Green Pigeons and more raucous Abyssinian and Lilac-breasted rollers. 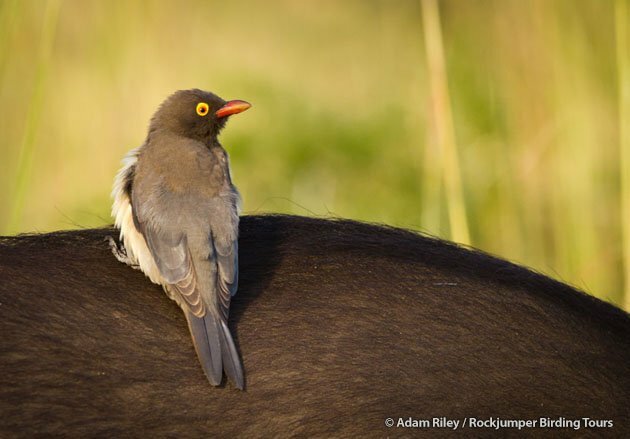 Starlings abounded both in number, sound and variety; with shimmering Greater and Northern Lesser Blue-eared, Superb, Rüppell’s and less commonly encountered Magpie and Shelley’s, as well as their close relatives Red-billed Oxpeckers which were enjoying rides on the Hamar’s donkeys! Small seedeaters added to these typical African birds; brilliant Purple Grenadiers, Red-cheeked Cordon-bleus and Green-winged Pytilias mixed with firefinches and waxbills to form flocks of colorful confusion! Quality time was spent with a friendly Hamar family at their homestead of grass huts surrounding their cattle corral. 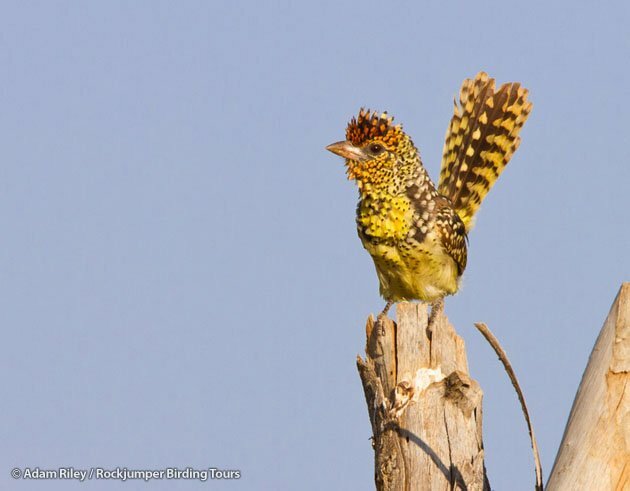 As we arrived a party of clockwork-like D’Arnaud’s Barbets were performing their comical tail-wagging display on the upright poles of the cattle corral. 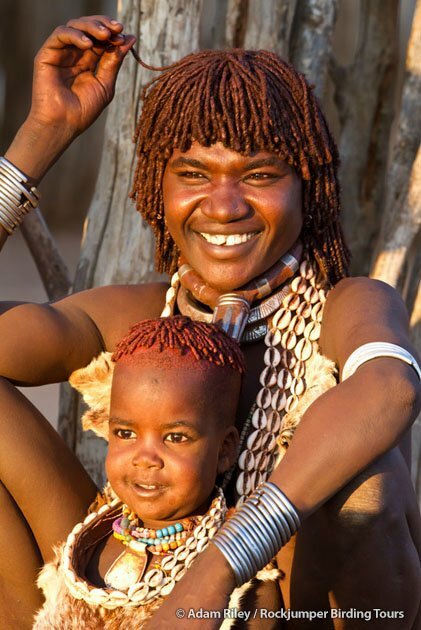 The Hamar women are immediately identifiable by their brick red hair braids, beautiful beaded jewelry and animal skin clothes designed to imitate gazelles. The Hamar are most famous for their ritual of bull-jumping, where young men have to leap onto and run across a row of bulls before they can enter manhood and marry. At the same time, female relatives of the initiate allow themselves to be severely whipped with saplings, forming permanent scarring on their backs and in the process cementing lifelong allegiances between the parties. The following day encompassed a long drive westwards to the Omo River itself, passing through ever wilder country on meandering dirt tracks. Game used to teem here until the downfall of the Marxist Derg government in1991, when millions of dollars of Russian-supplied arms were looted from military depots and circulated amongst the tribes people. 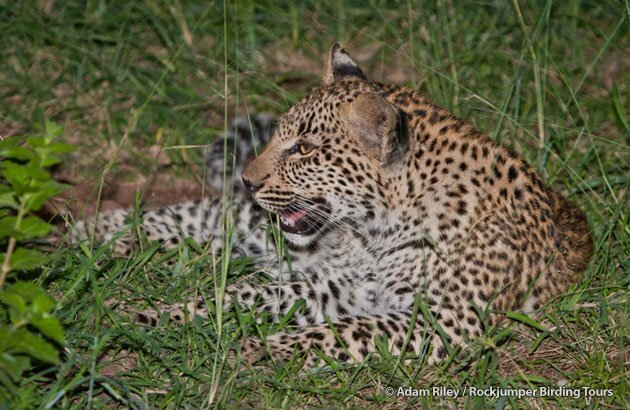 Now most men carry AK47’s, and outside of protected areas most game besides tenacious little Günther’s Dikdiks and shy Gerenuks are gone; and even in the national parks, the lions, hyena and larger game have had their numbers decimated. 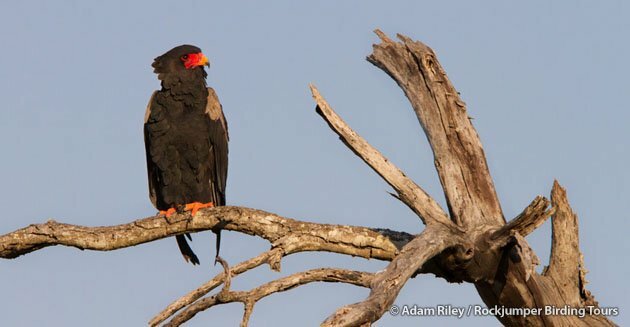 However the abundance of raptors indicates this land still maintains is natural integrity – vultures wheeled overhead in their hundreds, elegant Bateleurs rocked their wings as they swept low over the savannas, large eagles including migrant Steppes and resident Martials surveyed the landscape, Eastern Chanting Goshawks were regular sightings and diminutive Pygmy Falcons perched on stumps, waiting for lizards to move. We finally arrived at a high bend on the Omo River where a Karo village was perched. The Karo are a numerically small tribe that exist on what is known as “flood retreat cultivation”, tilling the fertile soils deposited by the annual flooding of the Omo River. They are famed for their body and face paintings and scarification, and we were privileged to spend some time amongst these regal people. 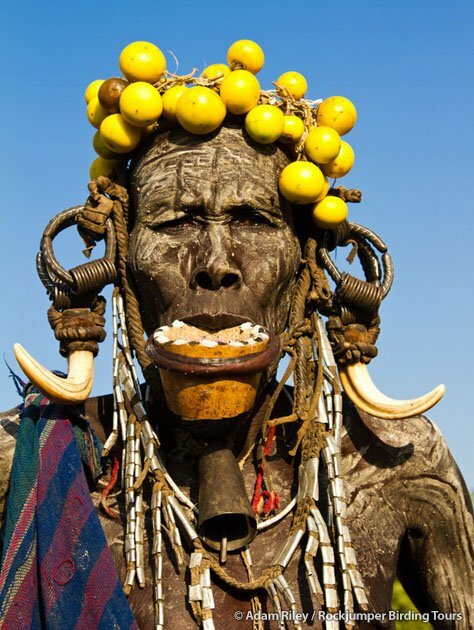 Further south, on the land along the final stretch of the Omo River and its great delta as it merges into Lake Turkana, live the Dassanech tribe or “People of the Delta”. 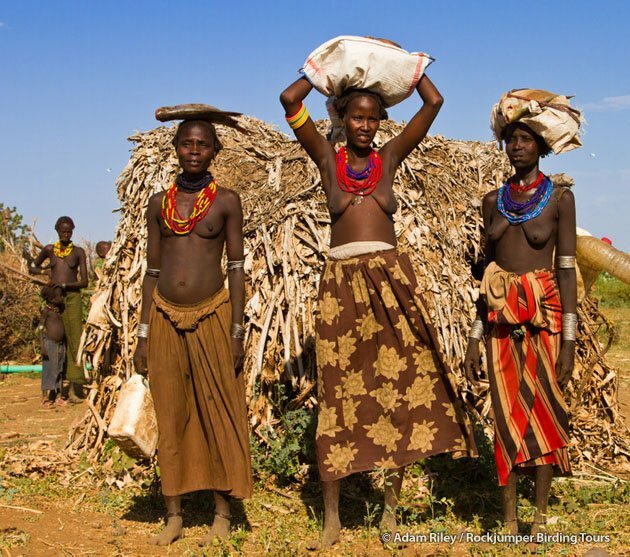 This tribe also inhabits neighboring regions of South Sudan and Kenya, where they have been persecuted, and this combined with the drought conditions often experienced in this parched land, has led to this tribe being the poorest of those we visited. Their fragile homes, meager belongings and scant livestock attested to this, and yet the people seemed content with their lot in life. They are traditionally pastoral people, but have from necessity accepted agriculture, fishing and crocodile hunting as means of survival. They adorn their bodies with decorative scarification, a painful process of slicing into the skin and rubbing the wounds with charcoal. We had decided to leave predawn to avoid the intense midday heat and this wise choice provided us with excellent nocturnal sightings, including Three-banded Courser, Black-faced and Lichtenstein’s Sandgrouse, Donaldson-Smith’s Nightjar, Senegal Galago (diminutive nocturnal primates), a family of Bat-eared Foxes, Black-backed Jackal, Common Genet and several other small mammalian fauna. As the sky turned rosy with dawn, we stopped for some excellent additions to our burgeoning bird list. These included busy flocks of bizarre Vulturine Guineafowl, the world’s heaviest flying bird – Kori Bustard and its small relative, Buff-crested Bustard, Black-headed Lapwing, Yellow-throated Spurfowl, Pink-breasted Lark, Red-fronted Warbler and both Steelblue and Straw-tailed whydahs, a fruitful outing indeed. 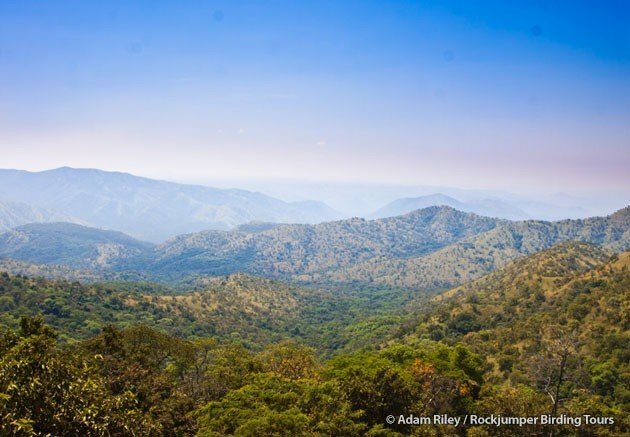 The final leg of our Omo Valley exploration had us relocate north-eastwards to Jinka, perched on an escarpment over the vastness of Mago National Park. The following morning, we departed early through the park, to the lands of the Mursi beyond the Mago River. Just after dawn we came across our first Mursi tribesmen, two herdboys driving their cattle to market in Jinka. One of them sported a pair of Standard-winged Nightjar feathers in his headband. 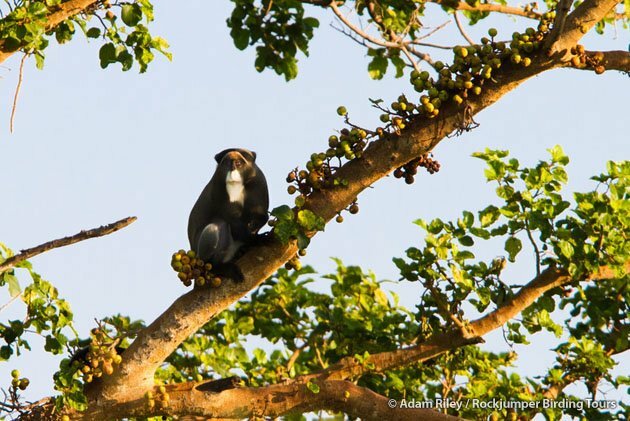 Game was not plentiful but the highlight was finding a beautiful female Leopard with her cub next to the road, and along the Mago River, a Da Brazza’s Monkey gorging himself on figs. The Ethiopian population of this little known, long-bearded primate forms an isolated population restricted to this area, so this was a very satisfying find. Even more so, was locating a family of Dusky Babblers, these rarely encountered birds occur mostly in inaccessible regions of South Sudan and northern Uganda, and this was my only lifebird of the trip. Other quality birds seen in the park that morning included the endemic Wattled Ibis, Banded Snake Eagle, migrant Pallid Harriers, Nubian Woodpecker and Brown Babbler. Mago National Park certainly deserved more exploration and I wished we had time to investigate the well appointed campsites along the Mago River. 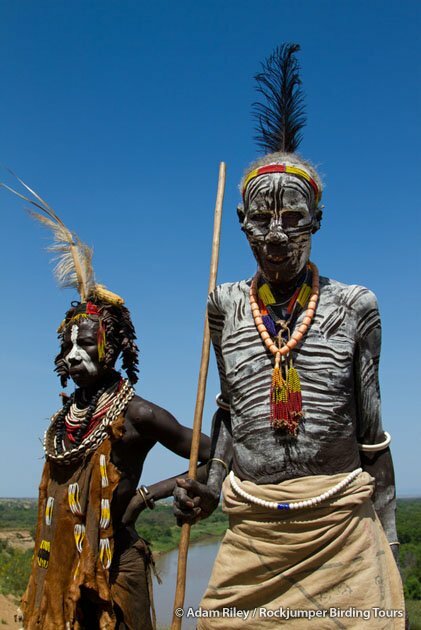 However we had a much anticipated cultural highlight awaiting us, the celebrated Mursi people. 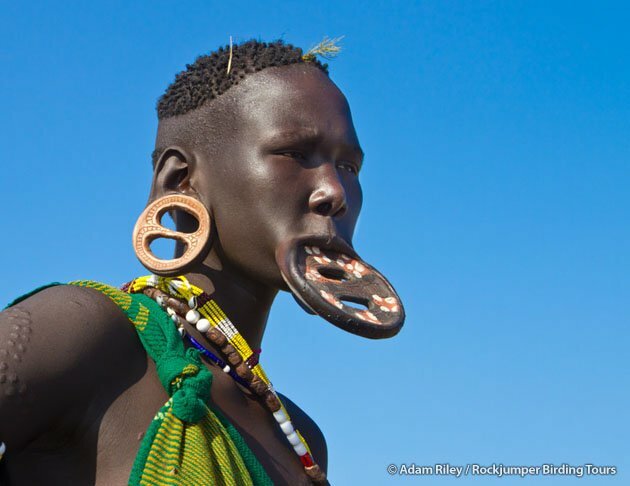 This tribe is famed for the incredible lip plates that the women wear. At around the age of 15, girls have the choice of undergoing the extremely painful process of having their lower lip sliced and a small clay or wooden lip plate inserted. 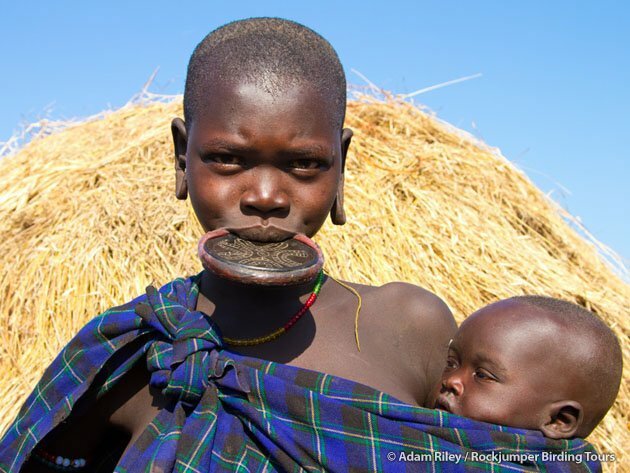 As the wound heals, this is replaced with larger and larger lip plates until they are able to stretch their lower lip over the back of their head and can wear lip plates of 5-inches or more in diameter! Several theories circulate as to the reason behind this bizarre practice, including that it was started to make the women less attractive to slave raiders or that it increases the bride-price, however the actual reason now seem to be lost in the mists of time and this practice is perpetuated because it is their custom. 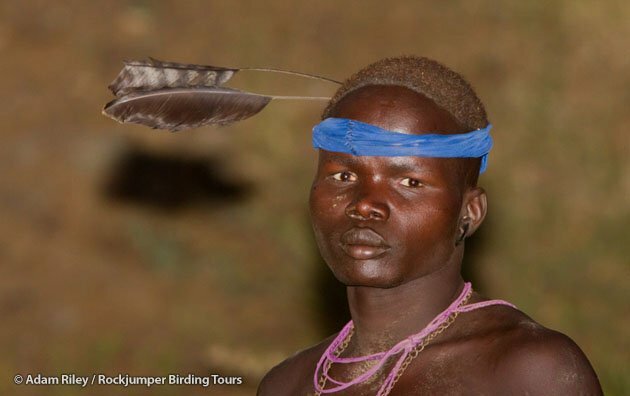 Our birding and tribal adventure in the Lower Omo Valley had come to an end and we returned to a more normal world, honored to have witnessed a truly beautiful and little known part of the world populated with people living ancient and untouched lives, much as each of our early ancestors must have done generations before us. The future of these tribal cultures faces considerable uncertainty. In 2006 the Ethiopian government started building the giant Gibe III Dam further up the Omo River. Despite numerous complaints and international protests lodged, as well as the fact that the disputed Environmental and Social Impact Assessment (that also apparently lacked independence) was done two years after construction began, the project is continuing and the end result will be the largest hydro-electric dam on the continent. Two more dams are planned thereafter further down the Omo River. The end result will be a massive reduction in the volume of water flowing into the Lower Omo Valley and Lake Turkana, disrupting these delicate ecosystems and the annual flooding. Riverine forests will desiccate and the food security of an estimated 100,000 tribal people who depend on the annual flooding for their livelihoods will be severely threatened. A further 300,000 people who depend on Lake Turkana will also be adversely affected. This is predicted to result in intertribal conflicts and the destruction of their traditional way of life and culture. Sadly the Lower Omo Valley is another entry to the ever-growing list of destinations that should be visited soon, before they are destroyed for the sake of development. You got very close to causing the Internet to collapse with your snow Leopard post. Maybe this post will do the trick! I agree with Jochen- this amazing post could very well collapse the Internet. 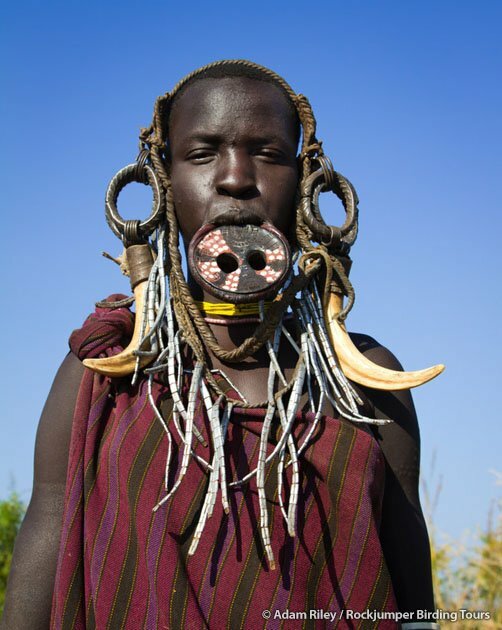 You make a good argument for the Omo Valley being one of the most interesting places on the planet. Beautiful photos! Both of birds and of people.